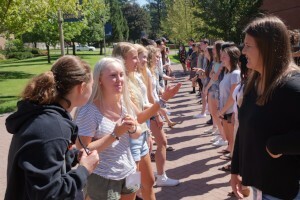 Youth Leadership Spokane brings together several dozen sophomores, juniors and seniors from all Spokane County schools for an intensive, 10-month program. 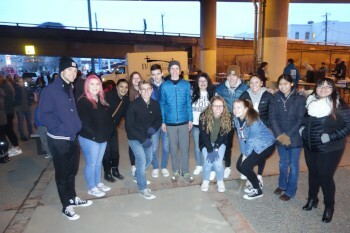 Each class session is held at a different location, which allows students the opportunity to tour important locations in the Spokane community. In the past, class locations have included: Waste to Energy Plant, Inland Northwest Blood Center, a TV station, the Police Academy, Fox Theater. Class of 2018 at retreat. Click here to refer a candidate! Youth Leadership Spokane (YLS) develops the next generation of servant leaders by creating strong and healthy youth, and empowering them for service to each other and to their community. You will understand and refine your unique role as a young servant leader in this community with hands-on experiences that tap your artistic and creative side. In addition to servant leadership, you’ll study diversity and learn how to lead effectively and well in cultures different from your own. You’ll learn about how the county and its cities govern themselves. You’ll gain understanding of the effects of poverty, substance abuse and crime. You’ll build skills in communication, running a meeting, team building and interviewing. You’ll have opportunities to mentor and be mentored and work cross-generational. You’ll be able to put your new skills into practice with service projects. You’ll get to know area leaders and will become an important part of a key leadership network that is leading this community into the future. Youth Leadership Spokane students will participate in small team projects throughout the year, some in cooperation with the adult Leadership Spokane class. Many of the projects and events will occur outside of the class sessions. Participation will enhance personal confidence and develop your understanding of the greater Spokane community. There is a full-day team building retreat in August, followed by one evening meeting a month, September through May. 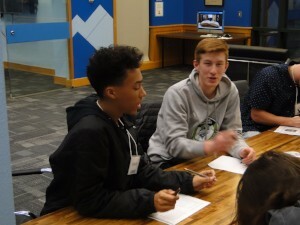 What is Youth Leadership Spokane (YLS)? YLS is a 10-month civic leadership training program, based on the principles of servant leadership and cultural competence. Youth have the desire to serve their community and get to know teens from other schools. 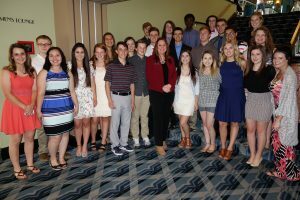 YLS gives them the skills and connections with area leaders so that they can be successful as young servant leaders. When was it founded? YLS was founded in 1996, as a program of Leadership Spokane. In 2009, Leadership Spokane and the YMCA joined forces to produce the program in partnership. This new partnership broadens outreach and improves service to area youth. What geographic area does Leadership Spokane serve? Students come from throughout the greater Spokane County area, from public and private high schools and home schools. What does YLS expect of me? Students must demonstrate a commitment to personal growth and to getting involved in their community. Students must have high standards of personal integrity and be able to dedicate the required time to the program. Who should apply for Leadership Spokane? Students who will be high school sophomores, juniors, or seniors in the fall of 2019 are eligible to apply. Applicants should want to get involved, learn about their community, enhance their leadership skills, increase their self-knowledge, gain a deeper understanding of diversity, meet new friends, and/or prepare themselves for the future. What is the tuition? Tuition of $125 includes all expenses for the retreat, materials and refreshments for class sessions, and graduation. Are scholarships available? Yes, scholarships supported by generous sponsors are available. We welcome applications from those with financial need and are honored to assist in this way. If I’m not accepted this year, may I re-apply? Definitely. Do I have to be formally nominated to the program? No. You are very welcome to apply on your own. How many people are accepted into the program each year? 30-40 candidates are chosen each year. How is the class chosen? Applications and references are reviewed and scored by staff. Final selection is based upon scores and what each student can gain from the experience as well as contribute to the cohort. The program’s goal is to put together a class with a variety of backgrounds and schools. That contributes greatly to a rich and challenging YLS experience. How will I benefit? You will understand and refine your unique role as a young servant leader in your community with hands-on experiences that tap into your artistic and creative side. In addition to servant leadership, you’ll study diversity and learn how to lead effectively with people whose background, perspective, lifestyle, and culture may be different from your own. You’ll learn about how the county and its cities govern themselves. You’ll gain understanding of the effects of poverty, substance abuse, and crime. You’ll build skills in communication and team building. You’ll have opportunities to mentor, be mentored, and work cross-generationally. You’ll be able to put your new skills into practice with one service project, at a minimum. You’ll get to know area leaders and will become an important part of a key leadership network that is leading this community into the future. What is the time commitment? There is a full-day team building retreat in August, followed by one evening meeting a month, September through May and a Commencement held in June. There is also a small group service project, with multiple opportunities to participate during the year. What presenters are featured in the class sessions? Past presenters have included Mayor David Condon, Spokane County Sheriff Ozzie Knezovich, Dr. Joe Albert and Dr. Josh Armstrong from Gonzaga University, Hoopfest Executive Director Matt Santangelo, Spokane Fire Department Assistant Fire Chief Brian Schaeffer, Lucinda Kay from Let it Shine Media, former EWU coach Beau Baldwin, Gonzaga Women’s Basketball Coach Lisa Fortier, war veteran and Ironman Major Scott Smiley, Timm Ormsby, Washington State Legislature, Representative Kevin Parker, Mike Gonzalez, KXLY; Ron Wells, Wells & Co. Bill McMillan, Habitat for Humanity and the Rev. Percy Watkins. What if schools are closed due to weather? YLS follows the area school districts. In the event that Spokane Public Schools are closed, YLS sessions will be cancelled and rescheduled. Leadership Spokane is proud to partner with the Horizon Credit Union and YMCA of the Inland Northwest. Our partnership broadens outreach and improves service to area youth. Public Safety Day at Spokane Police Academy, 2017. Governance Day, Class of 2018.